Recently, my alma mater, the United States Air Force Academy, played a football game against the University of New Mexico in Albuquerque. There was a weather delay to start the game and through a quirk of timing and the demands of television the national anthem wasn’t played until halftime. As the anthem played the cameras panned across the Air Force Academy football team who stood at strict attention, hands over their hearts. Even in shoulder pads, there was no doubt the young men in the white jerseys with the close-cropped haircuts were soldiers first and football players second. Across the field five New Mexico players knelt. I deeply disapprove of players, any players - college, high school, or professional - kneeling during the national anthem. It is, in my opinion, profoundly disrespectful, and those feelings of disrespect were particularly acute when five players knelt facing a sideline full of young men their same age who, when their college careers finished, volunteered to serve this nation. Many of them would soon be doing dangerous things in faraway places. Some would undoubtedly find themselves in harm’s way. Each of the cadets on that sideline, like anyone who serves in the United States military, has taken an oath to “support and defend” the Constitution of the United States. The New Mexico players’ right to speak - and make no mistake, kneeling during the anthem is political speech - is protected by the First Amendment. The unfettered freedom of speech is fundamental to our system of government; it is the foundation upon which all of our other rights as a free people depend. And like each of the players who stood along the Air Force sideline, I would fight to the death to preserve the right of the five New Mexico players to demonstrate their dissent and kneel. But when the game is over, the New Mexico players should come stand with the cadets. At the United States Air Force Academy, players and fans stand and sing twice during each game: once at the beginning of the contest for the national anthem, and once at the end for the Third Verse of the Air Force Song. TV announcers sometimes refer to the Third Verse as the Academy’s alma mater, but it isn’t. The Third Verse is what we sing to remember the Airmen who have gone before us. We sing it to honor our past and to remember that we belong to something greater than ourselves. It reminds us that we are heirs to a tradition of service that produced the Doolittle Raiders, the Tuskegee Airmen, the downed pilots who kept the faith at Hoa Lo Prison, and thousands more who, as the song says, love the vastness of the sky. Football games aren’t the only times we sing the Third Verse. We sing it to honor classmates we’ve lost. I can remember as a cadet standing together with the entire 4,000-member Cadet Wing and singing when we learned that of one of our graduates had fallen. Every Academy graduate since 1959 feels a sense of overwhelming pride, and loss, each time they hear the song. That’s why we sing it. On October 10, 2009, Air Force played Texas Christian University at the Air Force Academy. It was a wet, chilly Rocky Mountain afternoon. The temperature at kick-off was twelve degrees below freezing. TCU won. Following the game the Air Force players jogged over to face the Cadet Wing to sing the Third Verse with them. Then something happened I don’t recall ever seeing apart from our games against the Military Academy and Naval Academy. 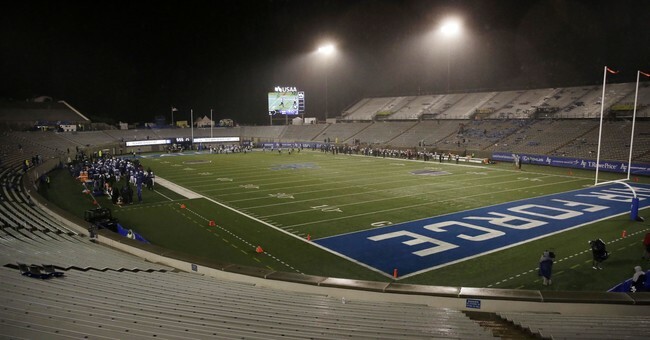 The TCU players followed our team to the sideline and in the icy drizzle stood behind the Air Force team as they sang. I appreciated the gesture and wrote a note to TCU’s coach, Gary Patterson, to express my gratitude. I wanted to let him know how much it meant that his players stood and shared the song with us. Two weeks later I received a note from Coach Patterson. Thank you, Coach. Standing together with the cadets was the right thing to do after that game in 2009. It is still the right thing to do today. Patrick "Kit" Bobko is a former two-term Mayor and City Councilman of Hermosa Beach, California and the author of "Nine Secrets For Getting Elected" available on Amazon. Kit is a graduate of the United States Air Force Academy and a proud Air Force veteran. He currently practices law in Los Angeles.